BMW has launched the all-new X6 sports activity vehicle in India in two variants priced at Rs. 78.9 lakh and Rs. 93.4 lakh ex-showroom Delhi. The BMW X6 is available as a completely built unit and is available at all dealerships in India. The new X6 has a redesigned chrome kidney grille, a new muscular bonnet, redesigned headlamps with LED daytime lamps, new foglamps, and new LED tail-lamps. The car has a tall-seating postion, but headroom in the rear seems slightly low. It has been given all-new interiors with a choice of leather upholstery. All the controls are angled toward the driver. The new BMW X6 is offered in Alpine White as a non-metallic color and while the other eight are metallic colours – Black Sapphire, Deep Sea Blue, Marrakesh Brown, Midnight Blue, Space Grey, Orion Silver, Titanium Silver and Vermillion Red. The new BMW X6 comes with a choice of either an eight-cylinder petrol engine or a six-cylinder diesel engine. Both engines come with twin-turbochargers and are quite powerful. The petrol engine puts out 407 bhp of power and 600 Nm of torque between 1750 and 4500 rpm. The car can accelerate from 0-100 kmph in a claimed 5.4 seconds, with a limited top speed of 240 kmph. The diesel engine puts out 306 bhp of power and 600 Nm of torque at 1500-2500 rpm and can accelerate from 0-100 kmph in 6.5 seconds. 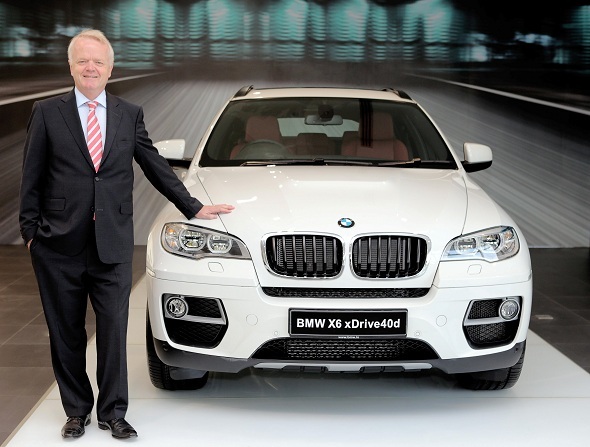 The diesel X6 has a top speed of 236 kmph. Both engine choices come mated to an eight-speed automatic transmission with paddle shifts for manual shifting. Features in the BMW X6 include two packages that customers can opt for. The Innovation package comes with driver-oriented features such as adaptive full-LED headlights, BMW heads-up display and BMW apps while the Luxury Package is designed specifically for customers with a focus on comfort. The luxury package includes special comfort seats with lumbar support, active seat ventilation and seat heating. The BMW X6 is a unique blend of sports coupe and SUV. This vehicle will appeal to buyers looking at a sporty vehicle, with a car-like feel, but also need that additional ground clearance and go-anywhere appeal of an SUV. It has tremendous road presence due to its size, but looks elegant enough from the front at least to do justice as a luxury car.